(Newser) – In a reversal of how this kind of thing normally works, the Bahamas issued a travel advisory Friday to its citizens visiting the US, NBC News reports. According to BBC, the advisory was brought on by the deadly week in the US. Or as the Bahamas' Ministry of Foreign Affairs puts it: the "shootings of young black males by police officers." The advisory states: "In particular young males are asked to exercise extreme caution in affected cities in their interactions with the police. Do not be confrontational, and co-operate." Bahamians, who are 90% black, are also advised not to join protests and to avoid crowds. 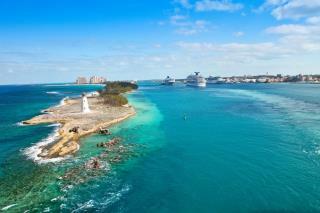 Monday is a national holiday in the Bahamas, and many residents are expected to travel to the US for vacation. Really? They issued a travel advisory? Given the killings there and the overt corruption by the police there? Pretty bad when you have to keep reminding black people not to be confrontational with police. I guess this exposes the real problem we are experiencing. My aunt got robbed at gunpoint in Andros last year. She lives in Atlanta and has never been robbed. So for her, the Bahamas are the most dangerous place she's ever been.